Dare you to take the Toxic Challenge! The only sour candy strong enough to be officially proclaimed HAZARDOUS! 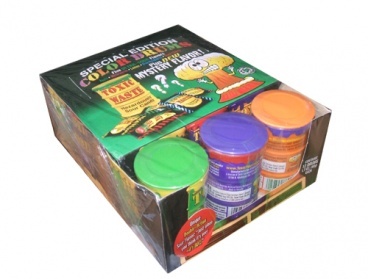 Each collectible container is shaped like an overflowing drum of Toxic Waste and comes packed with an assortment of super-sour flavors. 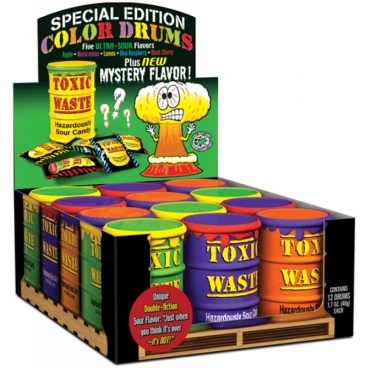 Deliciously sour toxic wast candy in 12 toxic waste drums. Each drum has 5 candies inside. Assorted flavors include Apple, Watermelon, Lemon, Blue Raspberry, and Black Cherry. and a new mystery flavor. Take the toxic challenge today!